Swimming pools lose billions of gallons of water every year as a result of freezing, contamination, and evaporation. This is an amount that can be saved with proper measures. For instance, above pool covers can address the problem and reduce water evaporation by up to 95 percent. Even when winter sets in, pool covers do a good job in keeping the water from freezing and prevent debris from getting into your pool. Despite its effectiveness in water conservation, less than 30% of pools use these covers. Well, you don’t want your pool water to go to waste or have its quality compromised, do you? In this article, we look at some of the best above ground pool covers that can do the trick. But before listing the top contenders, it’s worth noting that you need a cover that fits your pool with an extra overlap. The cover needs to be durable enough to withstand the elements, and of course, not be too heavy on your budget. And that’s exactly what we have in store for you in our list of the best above ground pool covers. This cover is designed for round above-ground pools. The cover measures 28 feet wide, a size that fits pools measuring 24 feet in diameter. It leaves a 4-foot overlap; a feature that eliminates any stretching or ripping. The cover is made of heavy duty woven polyethylene scrim to provide a strong construction that holds up well to wind, snow, and sleet. A coating is added to make it resistant to UV rays. The cover is painted black underneath to eliminate algae growth and keep your pool water crystal clear. This winter cover is waterproof, a feature that makes it effective in virtually any weather. This is a budget-friendly option for those in search of a pool cover for a 24-foot round pool. The cover comes in a dark navy blue color to insulate your pool against the freezing temperatures. At 28 feet wide, the cover fits perfectly leaving a 4-foot overlap. The cover is made of tough polyethylene scrim that holds up well to winter’s worst. Be it the sun, snow, wind, or ice this cover is sure to protect. There’s a winch tightener and heavy duty cable for easy anchorage. Have an oval above-ground pool? This above ground pool cover might just provide the perfect fit. It’s a commercial grade cover fabricated from heavy grade polyethylene and scrim. With such quality and durable cover material, it’s no surprise that this pool cover bears a higher price tag. The top of the cover is UV treated while the bottom is coated black to inhibit algae growth. This above ground pool cover is specially designed to fit 18 by 33 feet oval pools. It leaves a 4-foot overlap that provides an easy time anchoring the cover in place. The quality of this cover is one you can surely rely on. 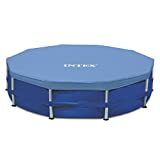 It’s a 28-foot round cover designed to fit 24 feet above ground pools. That means it leaves a 4-foot overlap for hassle-free anchorage. As a bonus, anchorage tools, such as grommets, heavy duty cable, and winch are included to make the process quicker and easier. The cover is made of triple laminated polyethylene with 12 x 12-inch scrim per square inch. Such a tough construction acts as UV light inhibitor to protect your pool from the sun. The cover is reversible so you can place it the way you want. Having trouble keeping out debris from falling into your pool? This above ground pool cover might just be what you need. It’s a round cover that provides a generous overlap for 15-foot pools. Equipped with metallic frames, the cover sits sturdily to take the weight of trapped debris. It has drain holes large enough to prevent water accumulation yet small enough to keep out debris. The cover comes with a heavy duty rope that tightens it up and keeps it from being blown off.